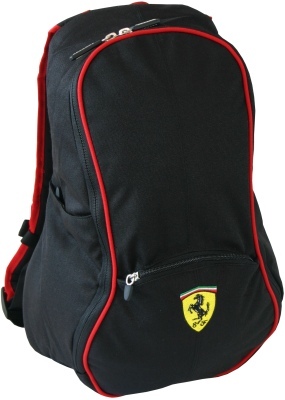 Ferrari Sculptured Scudetto Ruck Sack - Black. This Front opening Dynamic Pod shape design in 1200D 100% polyester matt oxford fabric, with embroidered shield logo,has a waterproof lining and Velcro fixings to internal pockets. Comfort mesh padding and padded shoulder strap with integral handle have adjustable strapping. Dimensions 48 x 28 x 17 cm or 19 x 11 x 7 inches.